< Previous Questionable: What Do Editors Do? I love the idea of subversive cross-stitch but I’m a tad too lazy/busy to start. Well done to everyone who takes the time to make the time. Y’all rock because you give us nice things. Well, my current knitting project is a throw blanket and knife of awkwardly bulky for toting around. And it’s going to be 95 degrees today. So am air conditioned venue would be required. This is as tough one. I don’t think I would give a second thought to knitting/crocheting in public. What caught my attention was when I saw a woman doing Tai Chi in a public park early in the morning on my way to work, now that was amazing. I knit in public all the time! Wish I’d had the nerve to do it back when I was a lawyer, and spent hours waiting in courtrooms waiting for my case to be called. Best public knitting experience was when I was at a hotel in TX that was rumored to be haunted, and what I didn’t know when I sat down in the lobby to knit while I waited for my brothers was that the haunting took the form of a woman knitting in the lobby. So I was blissfully ignorant until a little kid came over to ask me if I was a ghost. I crochet in public all the time, but I have no time for that today. Today I take the bounce-a-matic shark jaws (aka puppy) to puppy class. Whoop whoop, posting with the new device!!! Loosely related question about fiber. At a rummage sale today, I bought 8 linen napkins for a quarter, intending to use the lace trim for art projects. But a closer look shows they are perfectly starched, unstained, only faintly yellowing in a couple places. Is it a crime to cut them up? I love cloth napkins…. I buy them whenever I can find a good price on them. (And cloth hankies too). There are a million handkerchiefs and napkins out there with tatted and crocheted borders. Depending on how the lace is made, though, it may unravel if you cut it. Probably best to cut the linen, not the lace. No crime if you repurpose with good intentions. I do it all the time and haven’t gone to jail yet! I don’t knit or crochet, alas, and so sat in the corner with my laptop, as usual. Can it be Write in Private Day too? That’s hilarious to me. I knit in public all the time, but I’m too shy to write in public. To each her own, I guess. I knit at my book group today, which is not exactly wandering the town, but people saw me knitting, so I am counting it. Of course, people see me knit all the time – in lines, staff meetings, 5th grade band concerts – so today didn’t really stand out. I just realized! 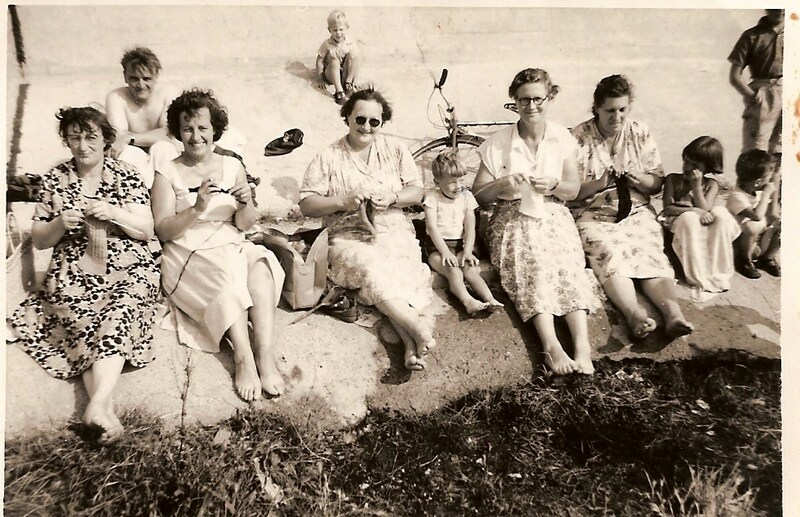 It is socially acceptable to sit somewhere in public at a specific event and knit or crochet etc. So many work meetings or eventss would be more easily navigated with some fibre craft in my hands. BUT, show up with a novel and I’d be reminded to pay attention. It’s using two skill sets listening and visual-motor without the one preventing the other from occurring. Huh. Goes off in search of her unused knitting needles. Maybe the “in public” part is to discourage people who do some truly weird stuff and would like permission to do so in public. (The guy on the Hoboken ferry whose newspaper was, uh, dancing on his lap comes to mind.) People like that can keep waiting for their “in public” day to come, but as far as I’m concerned, it ain’t happening. Not fiber, but I did stained glass in public at the Columbus Arts Festival today. That should count! I’m a marketer, so my default setting reading this is that someone (yarn retailer?) wants to increase sales. People knitting in public might lead to more people knitting (and buying yarn) because it’s sparks interest and desire in onlookers. No onlookers in private knitting. I’m not always so cynical. Marketing can be a force for good. For me, it’s more “what am I doing with my hands?” Sitting peacefully is not something I’m good at. I crochet while I watch TV because I can’t just SIT there. And yes, maybe K/CiP Day is a marketing tool, but yarn addiction is healthy and productive (for the most part, until I walk into the local yarn store and my heart races as my wallet slowly empties while I buy all the pretty things). Yarn doesn’t give people cancer, infectious diseases, or destroy families. It gives us sweaters and blankets that sometimes get donated to the poor, so what’s the harm? Maybe it’s for yarn bombing? I was with my husband at a work event (he teaches high school) a couple weeks ago, and was knitting while we hung out. I got “caught knitting in the wild” by two high schoolers (one male, one female) who were over-the-moon to see someone else who shared their hobby. He showed me his finger-knit necklace, and she talked about how shy she’d feel doing what I was doing. I showed them my project and we talked for a minute before going our separate ways. It was delightful. On a not-totally-unrelated note, I also nursed in public whenever necessary. I think KIPday is about the same thing: normalization. While I crochet and can knit, it has been my handing piecing quilt project that I like to work on to fill in the focus gap between what I’m really there for and that part of the mind/hands that are unoccupied and need a distraction. I just wish I could get working on a fiber art a more accepted practice for meetings at work. It’s never too late if the comments are still open. The blog shuts down comments after a certain amount of time, but it’s a long time.